In Reply We thank Dr Brito and colleagues for the Letter that brings attention to the potential impact of new terminology, noninvasive follicular thyroid neoplasm with papillary-like nuclear features (NIFTP), on the performance of molecular diagnostic tests for thyroid nodules. 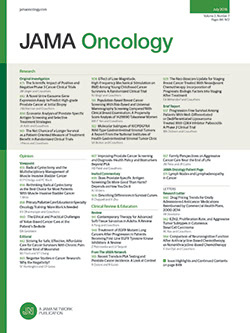 The authors estimate that as a result of reclassification of noninvasive encapsulated follicular variant of papillary thyroid cancer (EFVPTC) as NIFTP, the positive predictive value of molecular tests and specifically of ThyroSeq v2 will decrease from 83% to 52% in fine-needle aspiration samples with Bethesda IV cytologic diagnosis. This prediction would be accurate only with respect to diagnosing cancer. However, it is important to point out that the study we reported in JAMA Oncology did not reclassify EFVPTC as benign and NIFTP is not equal to benign disease.